Many piercings have their ups and downs, resolving without assistance. Mostly caused by improper cleaning routines and minor irritating daily habits. Over cleaning can irritate the wound and keep it open longer. Under cleaning can lead to infection. Alcohol, Iodene, Surgical spirits, Dettol, TCP and Hydrogen peroxide are all considered to be too harsh to use on a small wound too regularly. Ointments tend to be sticky and attract dirt and can limit oxygen to the wound. We advise two forms of cleaning, firstly gentle but thorough drying after bathing and second using a fine sterile saline mist as instructed by your piercer. Assuming the piercing was performed well, that the jewellery fits adequately and the individuals health is not to blame: piercing wounds can become chronic for a number of reasons. Most commonly it is due to external pressure from clothing, navel piercings in particular suffer from this problem and commonly surface piercings, resulting in a pressure ulcer scenario. Most cases will involve jewellery removal for the tissue to heal with minimal scarring. Without need for further treatment other than normal wound care. We urge you to call in for a consultation to overhaul all your aftercare routine, discuss your lifestyle and ensure your jewellery is fitting properly. Infections are few and far between but possible with any injury. As with anywhere else on the body: puss, excessive redness and pain will most likely indicate infection. As professional piercers we feel there is often no need to remove the jewellery to treat infection. Doing so may result in an further complications as jewellery often allows the infection site to drain, giving an exit for fluids. Unfortunately if the jewellery can be seen through the skin or nearly so, removal is essential. With correctly fitting jewellery and prompt proper wound care infections can be dealt with without the need to remove the piercing. When first suspecting an infection, the most immediate action would be to call your GP or arrange a visit to your local walk in centre. As antibiotics may be required. Between now and the appointment clean thoroughly with sterile saline every 3/4 hours. Use sterile gauze to dry the area. Call or message the studio for further advice. By far the most commonly misunderstood issue regarding piercings. What is often assumed to be an infection or keloid is most likely irritation. 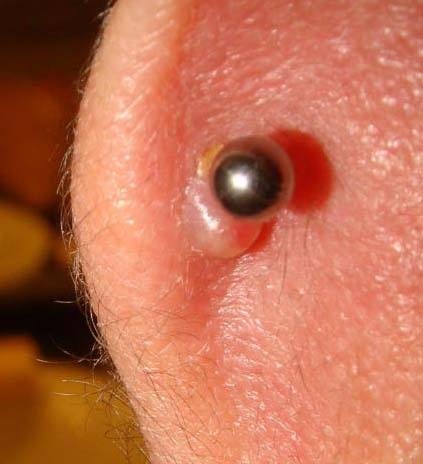 Although granulomas are a common problem in soft tissue piercings when they are associated with a cartilage piercing: irritation or scarring are much more likely. Firstly, there are different types of lump or bump. For this explination we will keep things simple and refer to them as either healed or unhealed. Healed bumps have become scars, refered to as keloids. The best method of treatment appears to be compression and massage with a natural oil such as jojoba oil. However this does not require the permanent removal of the jewellery. Treatment can only begin if the wound itself is healed, in many cases this is months after the initial piercing (see healing times) and it therefore becomes a priority to heal the piercing before treating the scarring or the further irritation will likely make it worse. The jewellery must again be large enough to comfortably allow for the extra tissue growth associated with scarring so therefore may require changing at a piercing studio. 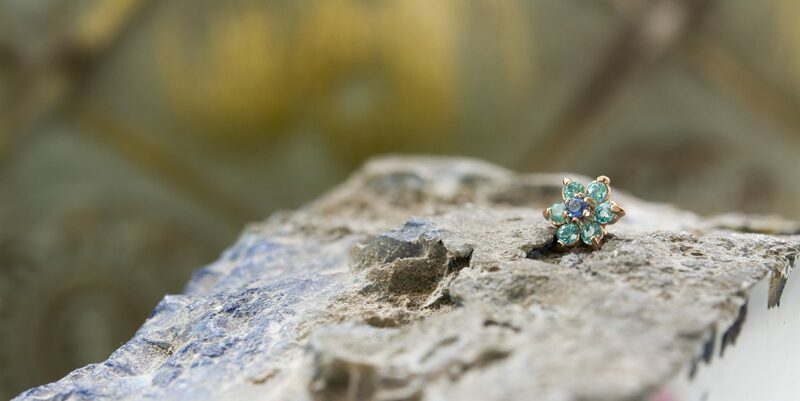 Keloids are most commonly caused by excessive movement of the jewellery, for example: sleeping against the piercing, cleaning to vigorously or too often, touching the piercing during the initial healing, changing to soon or to ill fitting jewellery. In cases where the growth tissue has an open wound top (hyper-granulation) it is considered still unhealed a substance to dry out the lymph can dramatically reduce the size and discomfort involved until further treatment can commence. (After wound closure and full healing) Tea tree and witch hazel work well for some when applied 3 – 4 times a day for a week but can cause allergic reaction. We advise speaking to your piercer before beginning and treatments. There is a lot of poor quality jewellery available to wear in body piercings. Initial jewellery must be complient with UK regulation and as such be implant grade titanium, 24 ct gold, niobium or glass. After healing other metals are available. Surgical steel, Wood, Silicone, Teflon, Acrylic, Gold, PTFE to name a few. We strongly recommend avoiding silver if you have any sensitivities to metals. Jewellery must never flake or scratch on impact, if a sensitivity develops changing the material should rectify the problem again without any need to permanently remove the jewellery. If the patient can attend a piercing clinic immediately the jewellery should be left in place for that short while. If your jewellery is too long you will catch it and cause more irritation. If its too small, it can imbed, cause irritation lumps, swell and generally hurt. Too thin jewellery can migrate or cut the skin. Bleeding, although unsightly, is completely normal within the initial few days for any piercing. As we heal a scab covers the wound almost immediately. A scab is formed when proteins from white blood cells that help coagulate blood come out of the blood stream to protect the wound-and actually accelerate the healing process. However when a scab is knocked off or your piercing is caught or picked at; the site may begin to bleed. Apply direct pressure on wound with a clean cloth, tissue, or piece of gauze until bleeding stops. If blood soaks through the material, don’t remove it. Put more cloth or gauze on top of it and continue to apply pressure. Only clean the surrounding area and not the actual scab off the piercing for 12-24 hours. Repeat this process as often as is required and contact the studio if you would like extra reassurance. Upon occasion we see allergy’s to cleaning solutions. With the appearance of burnt/orange or weeping surrounding skin. We advise our clientele to clean when needed with a mild sterile saline solution. When a stronger solution has burnt the skin switching to saline should rectify the problem. Jewellery removal should only be needed if the effected area has blistered or if the jewellery is visible through the skin. Need to take your jewellery out?